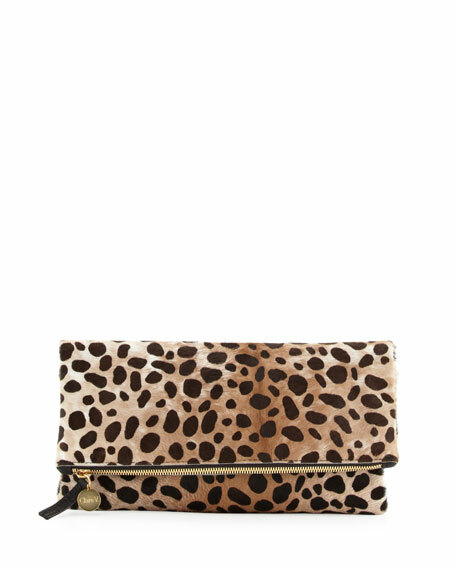 By Clare Vivier, this ultra-versatile fold-over clutch achieves new levels of luxury in leopard-print calf hair. 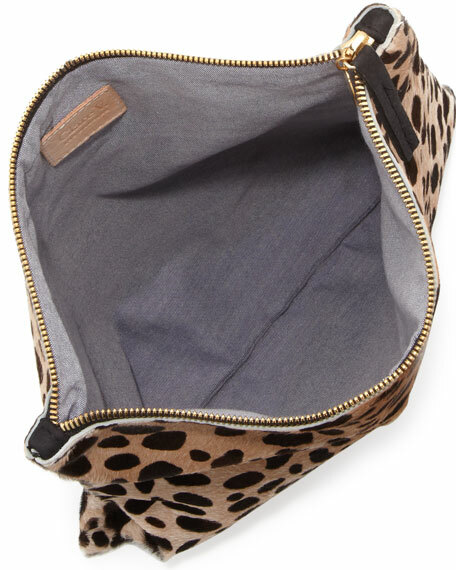 Leopard-print dyed calf hair (USA). Fold-over flap with zip top; logo disc at pull. Inside, cotton canvas lining; leather logo patch. 11 1/2" square; 6"H x 11 1/2"W when folded. Rooted in Los Angeles, Clare Vivier founded her eponymous handbag line in 2008 in response to a lack of both fashionable and functional accessories in the marketplace. Marrying French glamour with L.A. cool, Clare Vivier designs bags that are both timeless with a bold aesthetic and carry easily season after season. Proudly choosing socially conscious construction, each Clare V. bag is produced locally in the Los Angeles community from conception to fabrication. For in-store inquiries, use sku #34652.